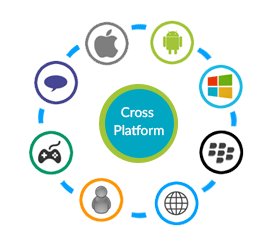 Cross-Platform mobile application development refers to the technique of making single codebase for applications that will be used on different types of operating systems. In this digital age, major businesses and brands are facing a great challenge of mobility support across various platforms and devices. As the number of devices in the market is increasing day by day, this challenge has become a serious threat for organizations those who have leveraged in a mobile platform. Cross-platform app development frameworks have become the inevitable tools for the site developers as it requires less time and resources and development team has to designative apps for Android, Windows phone and iOS. Simultaneously, some of us use small and big sized screens with varied resolutions, touch screens or keyboards. 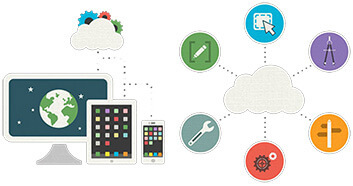 So a cross platform app developer has to combine all these to create a new environment and we, the CloudZon have skilled professionals who can design a platform that increases revenue, which looks, function seamlessly on any platform, offers the same experience given by desktop on mobile devices, timely delivering to market with low costs and in a nutshell to design an app with all features that you are longing for. This makes us the best cross platform mobile app development organization not only in India but all over the world. We are best at offering a native App in which the user interface has all the technologies used as those for the web. We create a responsive design and HTML-5 based frameworks to allow fitting any sized screens of mobile devices. If you need to hire a cross-platform mobile app developer who uses open source technologies, create customs apps using HTML5 and CSS3, who can provide tablet device and Smartphone features such as contacts, calendar, GPS, who creates a native lookalike design on mobile devices, who can assist with providing you app with Google Play store, Apple App store, Blackberry App World and support all mobile platforms including Android, Blackberry, iOS (iPhone, iPad) and Windows mobile, you have come to the right place. Experience our Cross-platform development services.